Born out of Sacramento, and recently signed to Classic Rock magazine's upstart label, Powerage Records, Endeverafter, is the brainchild of guitarist Michael Grant. If you long for days of the Eighties, then this album is for you. This is not exactly sleaze or glam or hair rock; rather it's the rocking and rolling music that you remember from that day, with a few twists to keep you guessing. And you know that never gets old, that is, if it's done well. Well, Mr. Grant and company have done well. Who said America cannot produce great melodic rock? Well, frankly, I did. 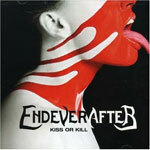 Now, I eat my words with Endafterever's 'Kiss Or Kill.' Hopefully, with Powerage Records help, soon the rest of the world will catch on, too. You've got about everything here: audacious vocals, swaggering guitar licks, a tight rhythm section, and some often raucous lyrics. The opening track is shear Eighties, Sunset Boulevard, punk mixed with rock 'n' Roll. Michael Grant sounds like a sober Steven Tyler on crack (figure that one out!). 'Gotta Get Out' is another fine song. Simply, it has enough tricks and slick guitar licks to keep your toes tapping and your ears listening for what's next. 'Next Best Thing' interrupts the rowdy rock with a nearly AOR ballad that demonstrates Grant's amazing vocal versatility, not to mention his guitar work. 'Road To Destruction' brought back memories of GnR at the onset. However, Grant is a completely different vocalist than Axel Rose (no paranoia here, just even delivery). The arrangement is fast and the result is a blistering number. Do you want a change of pace? 'Slave' sounds like more modern American rock than anything else on the album. The difference between them and, say Nickelback, is that they do melodic hard rock with creativity and cleverness. 'From The Ashes Of Sin' defies the conventions of this album: there's elements of hard rock, metal and the progressive nuances of each on this song. Very good stuff! 'Long Way Home, the final song,' is a track that is nearly indefinable. There is much going on musically here. It seems almost emo (yuk!) from the beginning, but I would rather classify it as Cinderella-type blues rock. It shows the diversity of Endeverafter, or more specifically, Michael Grant, and makes you believe in the creativity of this band (even if it seems to be based on the talents of one person). Good rock and roll is not lost in America. You just have to look heard (really hard!) to find it. Endeverafter is another great hope for American music. 'Kiss Or Kill' is lots of fun with an abundance of great tunes. My only reservation is this: can Endeverafter survive when it's core is a single musician? Let's wait for their next release to answer that question. Check out their music on MySpace or simply buy the album. It's worth your time and effort. Very recommended! Endeverafter comes from California, the creation of guitarist Michael Grant. In a single verse, this is great American melodic rock that gives you memories of the glory days of the Eighties. But it is not all sleaze, glam or whatever. It's just good rock 'n' roll with some twists that you would not expect from its roots. I say, check it out and listen for yourself: you will be pleased!